Mobile technology has allowed consumers to get news anywhere, and at any time, whether at work or home, while commuting or at a sports game. But are there certain times of day when Americans are more apt to engage with longer articles on their phones compared with shorter ones? And how does this match up with the times of day that articles get the most visits? The public’s tendency to spend more time with articles 1,000 words or more than with shorter ones holds true across all parts of the day. In all five dayparts studied here, readers spend about twice as much time with long-form news content than with short-form. For this part of the analysis, researchers first divided the day into five distinct time periods: morning (4 a.m. to 9:59 a.m.), midday (10 a.m. to 3:59 p.m.), evening (4 p.m. to 7:59 p.m.), nighttime (8 p.m. to 11:59 p.m.) and late night (midnight to 3:59 a.m.). We then examined the total time a user spent with an article within each time frame. This means that, for this analysis only, if a user interacts with an article at two different times in the morning and then comes back later in the evening, the total time of the two morning visits are counted as one interaction and the time for the evening visit as a separate interaction. For both story lengths, the longest average engaged time occurs in the late night and morning hours. For long-form reading, that amounts to 128 seconds late at night and 126 seconds in the morning, compared with 60 seconds and 59 seconds, respectively, for shorter stories. This stands out in particular, because late night attracts a smaller portion of visitors than any other daypart – just 6% of sessions with long-form news occur in the late night hours. Looked at another way, which accounts for the different number of hours in each daypart, late night gets about 400,000 long-form readers per hour compared with 1 million or more per hour during every other daypart. 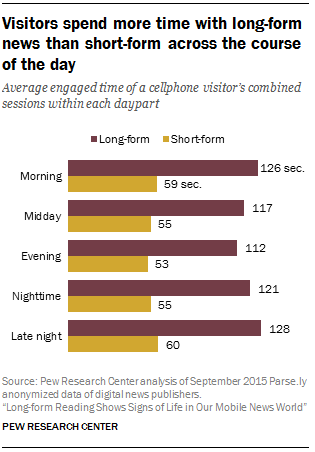 Short-form visits are similarly less common during these late hours. To help understand further the dynamics of long-form reading at different times of the day, we also looked at differences between weekend and weekday interactions. The data show that, overall, there is little difference in the time users spend with short or long news articles on weekends versus weekdays. On average, users spend 128 seconds with long-form content across Saturday and Sunday, 7 seconds longer than across the five days of the week. Time spent with short-form is nearly even between weekdays and weekends. 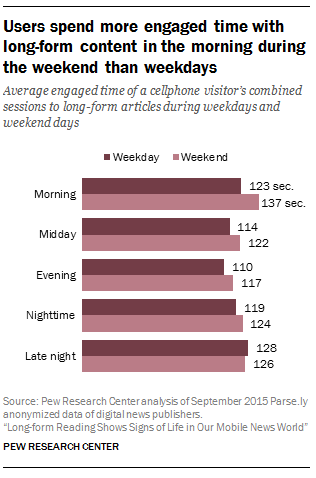 On the weekend, then, the cellphone remains an enduring part of people’s long-form news consumption. When you break the analysis down further by time of day, a few subtle “weekend effect” differences do pop out for long-form reading. Mainly, on the weekend, morning time seems to have a little more staying power for long-form reading. Long-form readers spend 137 seconds of engaged time in the morning during the weekend, compared with 123 in the morning during weekdays. During the week, nighttime and late night average reading times are on par with morning.